Vaughan Sound has installed hearing assist, public address, background music and audio-visual systems as part of the £4.2m revamp of the Grade II listed Penarth Pier Pavilion in South Glamorgan. Plans to completely refurbish and upgrade the art deco-style pavilion were approved in 2011, with the 12-month project commencing last October. The pier itself first opened in 1895 and has great heritage within the coastal town of Penarth. The original pavilion was lost to fire and replaced by the current structure, which opened to the public in 1929. However, it fell into a poor state as its fortunes waned - including being hit by two large vessels in 1947 and 1966 - and it was later closed in the 1970s. Funded by the Big Lottery Fund, Coastal Communities Fund, Heritage Lottery Fund, Welsh Assembly Government and Penarth Arts and Crafts Ltd (PALC), Vaughan Sound has played an important role in this large-scale project to resurrect and create a bright future for this multi-functional building on the famous old pier. Housing a café, cinema, gallery, learning space, observatory, restaurant and shop, Penarth Pier Pavilion is now one of the leading community attractions on the South Wales coast. Originally introduced to the project by Hoare Lea, Vaughan Sound was appointed by M&E contractor Whitehead Building Services of Newport. Having worked together on a number of community and heritage projects, Vaughan Sound was tasked with designing and implementing a range of technical solutions. Several audio frequency induction loop systems were installed to comply with Approved Document M - Access to and Use of Buildings, the Disability Discrimination Act and the Equality Act. Current Thinking ET120 and ET450 amplifiers and counter loop systems were installed within the auditorium, café, learning room and reception, whilst a PL1K portable amplifier with built in microphone was also provided. An eight-zone public address and background music system was specified for the key areas of the building. A Cloud 46/50 four-zone mixer amplifier, PM4 paging microphone, four RSL6 remote source select/volume controls and a number of Apart Mask 6 cabinet speakers were chosen to relay voice announcements and background music to each area, or combination of spaces as required. A Tascam CD player with iPod dock provides a background music source, which is muted during paging announcements. 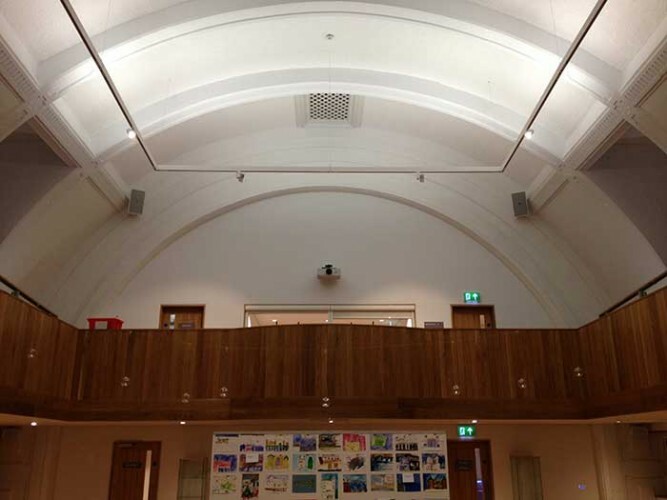 A full range sound system including Symetrix digital sound processor, plus a portable lighting rig and DMX lighting console were installed within the learning room, along with multimedia projection to provide a state-of-the-art multifunction space. 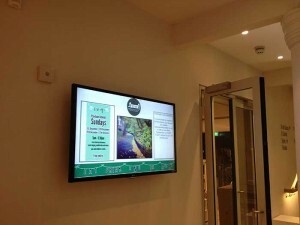 Finally, Vaughan Sound installed a digital signage system comprising of three 42" LG commercial screens linked to a Sedao digital signage player, allowing staff to dynamically display information and content relating to upcoming events at the Pavilion. Managed by registered charity PALC, the fully refurbished Pavilion officially re-opened on December 1, with a full schedule of exhibitions, films and activities getting underway in the New Year.